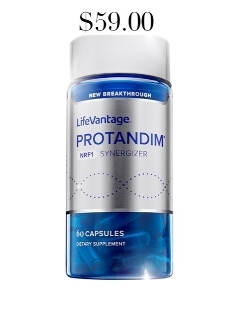 Protandim® NRF1 Synergizer is a breakthrough in nutrigenomics and the ght against aging that uses ingredients to harness the energy of youth—mitochondria. With age comes wisdom and maturity. That’s the upside. But you also get all the wrinkles, more aches, and overall lack of energy. Getting old isn’t easy. We get it. We also understand why. Thanks to breakthrough in nutrigenomics, we’re able to ght the signs of aging at the cellular level—right where aging occurs. It’s called Protandim NRF1 Synergizer, and it’s revolutionizing health and wellness. Unfortunately, we still haven’t discovered the fountain of youth. But we nally understand why we age. Every day, your cells are damaged by free radicals from natural processes like breathing and from pollution in your environment and diet. This leads to oxidative stress and a break- down of your health at a cellular level —one of the main contributing factors to the aging process. One of the most crucial keys to slowing the harmful effects of aging and restoring a youthful feeling to your body is living in your cells. They’re called mitochondria. Mitochondria produce up to 95% of the energy your body uses. But those muscular, microscopic powerhouses break down as you age. It’s a natural part of oxidative stress. But fewer mitochondria don’t just mean less energy. Mitochondria also produce ATP (Adenosine Triphosphate)— the source of cellular energy that pumps our heart, supports muscle growth and maintains healthy brain function.